← Honey, What’s For Dinner? Līgo vakars is tomorrow and we’ve been patiently waiting for our kefir biezpiens to finish drying so we could make Jāņu siers (Latvian Solstice caraway cheese) today. Making this type of fresh cooked cheese is a semi-involved process that takes about an hour of active cooking time. We made a small cheese this year since it’s just the two of us but it’s great for starting out too. As far as biezpiens goes, I’m working on solidifying the process for making biezpiens from kefir and will test how to make it from buttermilk. For now, check out the comments on Gateway Cheese and read the Latvian pankūkas post for details on pressing kefir cheese to make a basic biezpiens. So without further ado.. Let’s begin! In a large pot over medium-low heat, heat milk until small bubbles start breaking the surface then add the kefir and biezpiens in small crumbles. Stir periodically, keeping the mixture hot but not simmering, around 160F. (I live at a high altitude, so your temps may vary.) Curds will begin to form around the biezpiens. As the whey begins to clear, keep a close eye on things. It won’t take long to go from mostly milk to mostly curds. Once it’s nicely separated, carefully lift out the curds with a slotted spoon into a cheesecloth-lined large colander set in a large bowl. Once you’ve removed most of the big curds, drain the bowl under the colander into a waiting storage pitcher for future use. Replace the bowl and carefully drain the remaining whey and curds into the colander. Drain the whey left in the bowl into your container. You can use this to make whey ricotta if you like or use it to add flavor in place of water. My husband loves to drink it cold! You need to press out any remaining whey, so gather up the edges of the cloth and wind up the cloth to help squeeze out some whey. Don’t be afraid to just grab on and squeeze too but be careful, it’s hot! Set the 8″ deep skillet on medium-low heat and begin melting the butter. Move to the cutting board and begin kneading the cloth-covered curds. Some whey will come out but it should be fairly dry by now. In a small bowl, mix together the egg and egg yolk, along with caraway and salt to taste. You’re looking for enough caraway to comfortably speckle the cheese which is probably a couple of tablespoons. Unwrap the cheese and add it, mixing it well with your hands. Now that the butter is melted, place the caraway cheese in the pan and begin mixing in the butter. The lower the temperature and the shorter the heating time, the more crumbly the cheese will be. Conversely, the higher the temperature and longer the heating time, the more solid the cheese will be. Always keep the cheese moving. It will be very crumbly in the beginning. Moosh it around, fold it, spread it, just keep it moving. Eventually, it will stop crumbling and start becoming shiny and elastic, much like good bread dough. Keep going. No, your arm won’t fall off. Press the cheese out so it fills the mold nicely then fold over the cloth and drop the other container on top. Fill it with something heavy. I used river rocks I bought at the local dollar store for a 50c a pound (there’s about 6 lbs as shown). This will make your cheese harder. Leave it out on the counter for a while so it can cool down then you can put it in the fridge to finish. Once it’s cooled and had a chance to start forming a hard rind, take it out of the mold, unwrap it, sprinkle some kosher salt all over the cheese and rewrap it before placing it back under the weights in the mold. Don’t touch for at least a few hours! Now, grab one of those beers you have waiting for Jāņi tomorrow. You deserve it! We’re following your Jāņu siers adventure with great interest (how much is 1/2 stick of butter?). All in all I am very happy with the way mine turned out – thank you so much for making it possible! I turned 2 liters of whole milk into kefirs using a dried culture which I was astonished to find here (the locals don’t really go in for such exotic stuff). This yielded about 320gm of “biezpiens” which I wasn’t able to turn into the dry crumbly product I remember my mother using but it wasn’t bad for a first attempt. You were quite right about having difficulty curdling just whole milk with my biezpiens and your mixture sounds much more suitable. Unfortunately the stuff which passes for buttermilk here is pretty awful and I was really afraid it might ruin what had been quite successful up to the point of producing the Jāņu siers. As I was unsure about what I was doing I probably did not work on the milk / biezpiens mixture for long enough and have not ended up with much cheese. The consistency however looked right and I did not want to push my luck too far. In the end though the finished product, what there is of it, is surprising good for a first attempt. It is quite dry and firm with a good flavour, although I probably added a bit too much salt. It will however go really well with beer tonight, which was really the idea in the end. Gunta lives on the outskirts of Rīga. I believe the milk she was using was from the Dundaga dairy and purchased in the central market in Rīga which was also the source of the biezpiens. Quite a bit different from the stuff I have access to, even though I did use the best milk I could get hold of. Once again many thanks for your blog – talk about serendipity, it was just what I needed. Our son and his wife are coming around for diner tonight and we’ll think of you and your husband as we have an excellent Tasmanian beer with homemade Jāņu siers. Sveiks! A half stick of butter is about 50 g or 4 tbsp. Out of the two liters of milk and kefir we combined with the biezpiens, we had a yield of just about 440 grams of Jāņu siers. You might have been able to push it more, but I think it was more due to not having everything in the milk to curdle. Buttermilk or kefir, it doesn’t matter, it’s all in what you have handy to put those good beasties back in! Oh, and did you know you can take some of the kefir produced from dry culture and culture more milk into kefir? It’s about 250 mL kefirs to 1.75 L milk, plus about 24 hours in the fridge. I’m not sure how many times you can reculture (I’ve heard 7 to 9 times) but for drinking kefir or making biezpiens, you can use pretty much any fresh milk at any percentage fat. It sure sounds like your siers came out beautifully, which is absolutely fantastic. Ahh, Centrāltirgus, that brings back happy memories. If only I could go to a market like that regularly! I couldn’t even while I lived there as I wasn’t in Rīga all that often but every time we were in the city, I went and puttered around. Great tips here, helped me out a lot. there are so many ways to make this cheese, it is hard to find the one recipe you’d like to follow, especially the first time around. one thing – biezpiens is the same thing as cottage cheese and can be made beautifully with vinegar, although I prefer a traditional method that yealds good, crumbly, wonderful cottage cheese, but requires good raw milk, which is hard to come by over here, unless you live in CA or have a farm or have access to one, the latter being my lucky option here down south. You basically let the milk sour or ferment naturally by placing it out in room temperature, covered with a cloth for a few days, as soon as you get a product that somewhat resembles buttermilk, you are good to go!- it’s not let to ferment to where it becomes “sourmilk” or clabber as its called down south or “skābpiens” as its called in Latvia, OR “filmjolk” as in Sweden – which is of rather thick consistency like yoghurt. But adding this soured milk to a 1:1 ratio of fresh milk and heating it will get you rather nice cottage cheese. I actually warm the soured milk by itself, covered up with a lid until you get the curds. Works either way. 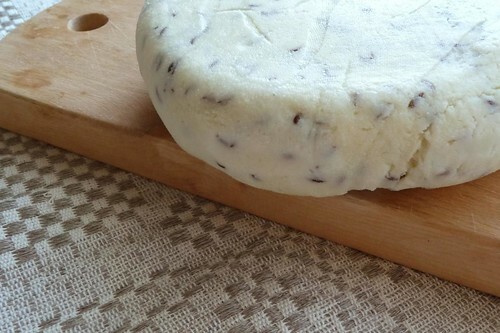 Gives you some of the best homemade cottage cheese or biezpiens. One thing to note, pasteurized milk will not work- it will simply turn bad. Not something I would like to experience. Regarding the cheese- I have read that not adding any eggs has been the traditional choice way back when and this cheese can actually be aged as well, as it is done in western Latvia- as far as I know- sat out in the sun by the sea to soak up all that salty air! Presumably without eggs. It’s a long way off frok the summer solstice, but this cheese is sure worth trying any time of the year!